Members: Enjoy free, unlimited yoga, spinning, studio and aqua classes. Online sign-up is available for Group Training (with a valid package) and Orientations. Guests: Find out more about attending as a non-member with your drop-in visit. Check the Exercise Schedule for class descriptions and sign-up requirements. 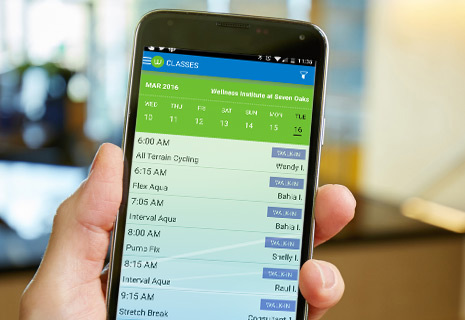 Visit our App page to view weekly classes on your mobile device or get the Spin Class app. If you have trouble viewing or scrolling the schedule below, open it in a separate window. Choose a Category on the weekly class schedule to view only the classes that interest you, from Yoga to Group Training! Find additional classes available to members and guests, including Stott pilates on mat or reformer, at our Program Registration page. Weekly Classes are also featured in our free app. Download it now and access your class schedule on the go with your mobile device!